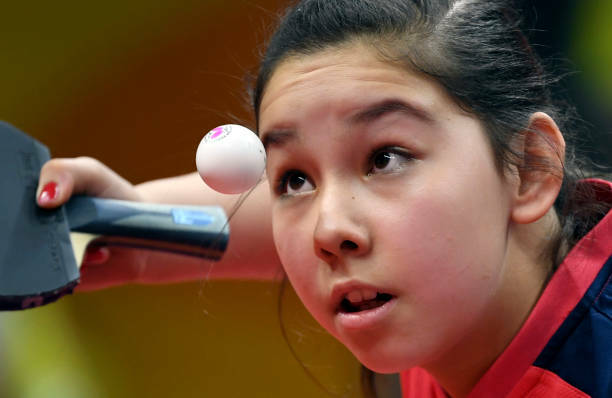 Wales’ table tennis prodigy Anna Hursey again showed her outstanding potential by winning the women’s singles at the Preston Grand Prix – aged 12. The Cardiff schoolgirl beat No 1 seed Haoyu Liu 3-1 (11-9, 9-11, 11-9, 11-7) in the semi-final. Hursey, who competed for Wales at the Commonwealth Games in Apil, then beat Diruiqi Yang in the final 3-1(11-9, 3-11, 11-9, 11-8). The performance was even more impressive from the youngster as she had just returned from an event in Shanghai with her Welsh team-mates. Anna, far right, after her victory in Preston. Wow, is she really only 12? Yep, going to be a star.